There was a passenger boat service on the canal from August, 1798, between Preston and Lancaster, which was extended through to Kendal on 1st May, 1820. The journey time for the whole length between Kendal and Preston was 14 hours, at a cost of six shillings in the fore-cabin or four shillings in the aft cabin. Refreshments were available to all passengers. Below right: The former packet boat Crewdson, later renamed Waterwitch II, after she had her cabin shortened and was in use as a canal inspection boat. Behind her can just be seen the packet boat repair house at Lancaster, where the vessels were repaired and serviced. Because of the length of the boats, the boat house is skew on to the canal to allow the boats to enter and leave. To try to combat the threat to the boat services from the railways, a new fast passenger service using swift packet boats was introduced. There were four vessels used on this service, which commenced in 1833. The first was the "Water Witch", an iron-hulled craft of a long, narrow, sleek design, with a length of 76 feet and a beam of six feet. She could carry 120 passengers, and cut the journey time between Preston and Kendal to ten hours. These boats were pulled by two horses, which were changed every four or five miles at stable points along the route; the second horse was ridden by a boy postilion who would sound his horn to warn other vessels of their approach. The fast packet boats had precedence on the canal, and any boat which did not give way risked having its towing line cut. The other three swift boats were called Swiftsure, Swallow and Crewdson (named after the Chairman of the Canal Company, but was later renamed Water Witch II). 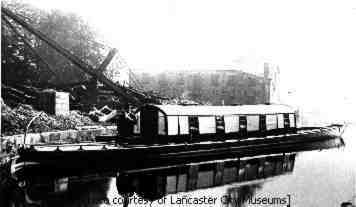 The fast packet boat services ended on 22nd September, 1846, when the Lancaster and Carlisle railway line to Kendal opened.